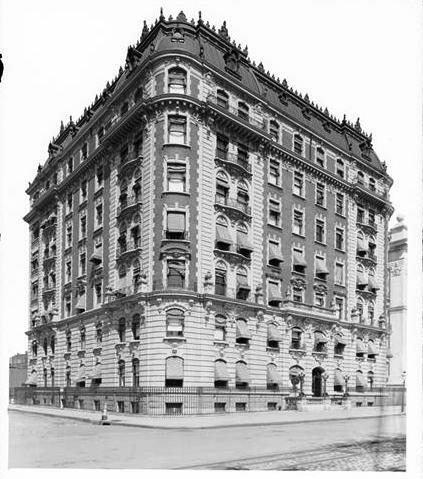 At the turn of the last century large and flamboyant apartment buildings were appearing on the Upper West Side. The sprawling apartments were intended to mimic private homes, with servants’ areas, libraries, and in some cases, even “hat closets” to accommodate the many large hat boxes of the lady of the house. Many of these took their architectural inspiration from Paris, giving Broadway and Central Park West a touch of the Champs-Elysses. 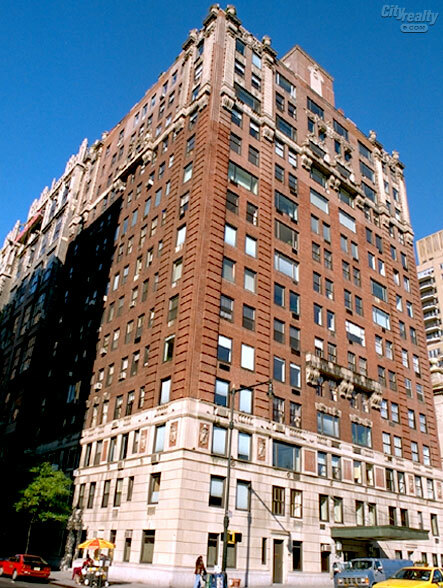 Among these was Chatham Court, at the northwest corner of Central Park West and 67th Street. Seven stories high and capped by a high, spiky-crested mansard roof, it was touted as “of the French Renaissance style of architecture. Red brick and limestone worked together to provide a handsome contrast of color and material. Beaux arts balconies, French ironwork and scrolled brackets frosted the building like a cake. Each apartment had two bathrooms (plus a servants’ bath). 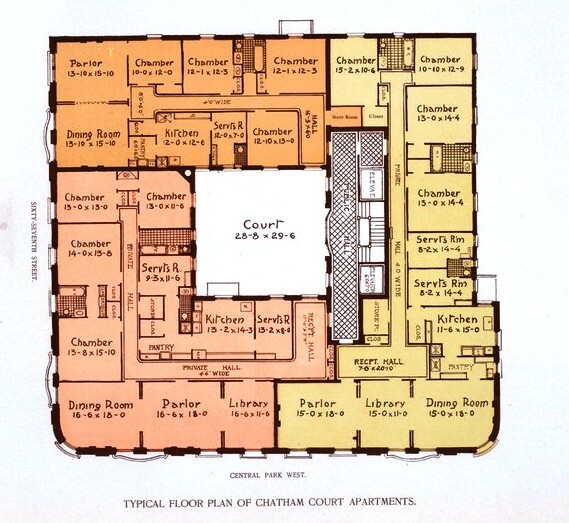 There were just three apartments per floor in which residents would enjoy a large reception hall, parlor, dining room, library and other rooms. 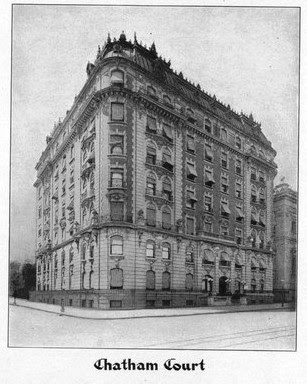 Pocket doors provided privacy or could be pushed open “into one large suite for receptions, etc.,” as explained by The World’s New York Apartment House Album in 1901. The dining rooms were large and formal, “finished in the old Flemish quartered oak with massive wrought iron fireplaces, Dutch stein shelf, parquet floor, etc., and connect directly with the kitchen through the butler’s pantry,” mentioned the Apartment House Album. The upscale tenants would enjoy the latest in conveniences including cedar closets, “lighted automatically by the opening of the door,” an “annunciation system” which communicated with the butler’s pantry at the push of a button, and chandeliers “controlled by switch.” Each apartment had a long-distance telephone. The moneyed residents expected management-provided services, and they got them. Twenty-four hour services included uniformed elevator boys (there were two elevators), hallboys, and porters. Mail chutes provided the convenience of mailing letters without leaving one’s floor. Rents were set at between $1,600 to $3,500 per year—between about $3,800 and $8,415 a month in 2015 dollars. The high rents did not dissuade potential residents however; even to the astonishment of Chatham Court’s owners. Among the first to move in was the family of Dr. Edward Wallace Lee; and Louis Plaut, his wife, his widowed mother, and his two daughters, Blance and Hortense. Plaut was President of L. S. Plaut & Co., described as “one of the imposing department stores in [New Jersey].” Plaut’s store employed more than 1,000 persons. The wealthy businessman Henry Harris Barnard lived here with his family in 1908. Along with his involvement with the Church E. Gates Lumber Company, he was a director in several other firms, and a member of the Chamber of Commerce. On February 10 that year The New York Times reported that he had died in his apartment two days earlier. It soon became evident that the family had airbrushed the details of his death. Dr. Sharp stressed that he did not think that Barnard had committed suicide, but had simply fallen into the snow-covered well on his routine morning walk. The Coroner, Dr. A. O. Squire, was uncommitted. “It was either a case of suicide or of accidental death,” he said. Jeannette Emmons lived happily with her husband, Forest Oviatt Emmons, in Chatham Court until 1909. The chorus girl had married Emmons in 1907. But in 1909 she landed a part in playing on stage with De Wolf Hopper in Happyland. She and another chorus girl, Maud Anna Thomas Emmons, found it coincidental that they shared the same last name. Their surprise turned to anger when they started talking. Both were married to the same man. Maud had married Forest Emmons in 1898. On April 29, 1909 The New York Times reported that both women were in court asking for an annulment of their marriages. “Both went on the stand and helped each other to regain their freedom,” reported the newspaper. The cloak of respectability was ripped away by Federal agents on the night of April 22, 1910. Gatin’s chauffeur dropped him off in front of the apartment building just after dinner that night. Department of Justice agents were waiting on the sidewalk. They followed him into the building and stepped into the elevator where they produced a warrant for his arrest. “At first he stoutly denied that he was the man wanted,” reported The Times, “protesting so loudly that some of the tenants were attracted, under the impression that some sort of hold-up was in progress.” Not wanting to draw more attention to himself, Gatins went quietly with the officers, still proclaiming he did not understand why he was being arrested. Gatins did not let his indictment get in the way of his making money. Four months later, he amazed the financial and legal world by suing a brokerage firm “on the ground that he had lost $140,000 because the firm by not acting on his orders had prevented him from making a spectacular coup in Hocking stock the day before that stock went to smash,” explained The Sun, later. One of the sons receiving the magnanimous gift was 23-year old Benjamin Kiely Gatins. For a year the sports-loving young man had caused consternation within the socially-prominent household of Mr. and Mrs. G. Jason Waters. Then, on Wednesday morning, April 10, Dorothy left the Waters’ Madison Avenue mansion carrying only a handbag. Unknown to the family, she had stuffed it with her jewels. Around 10:30 that morning the couple procured a marriage license after Dorothy lied about her age, saying she was 21 years old. They were married before noon in the rectory of the Church of the Blessed Sacrament, on Broadway and 71st Street. The elopement was a social blow to the Waters family. “Mr. Gatin’s mother would not tell his whereabouts last night,” reported The Times on April 13. The family of Henry E. Barnard was still living here at the time of the elopement. Following Barnard’s death, his sons Frank and Edward took over the operation of the Church E. Gates Company. Frank was in charge of the Oak Point lumber yard in the Bronx. On February 23, 1912 he took a suitcase to work with him, as he planned to go away for the weekend. That evening he started across the Legget Avenue viaduct which crossed over the New York, New Haven and Hartford Railroad tracks. The Sun reported the following day “The district about the viaduct has been the scene of a number of holdups recently.” A thug watched Barnard from behind a viaduct girder. Authorities assumed he thought the satchel contained the company’s weekly payroll. Barnard had made it about 75 feet along the viaduct when he saw a flash come from behind a girder only a few feet in front of him. “At the same instant he felt the blow of the bullet as it struck his mouth,” reported The Sun. Barnard realized someone was attempting to hold him up and he ran. He made it to a railway shanty where he told an railroad employee, John Burke, that he had been shot. He then collapsed on the floor. Police arrived, as did a doctor from Lebanon Hospital. The bullet had entered Barnard’s mouth, breaking several teeth. Because he had never seen his attacker, he was unable to provide any description and the assailant was never caught. The expansive apartments gave way to hotel rooms and the building was rechristened The Town House Club. 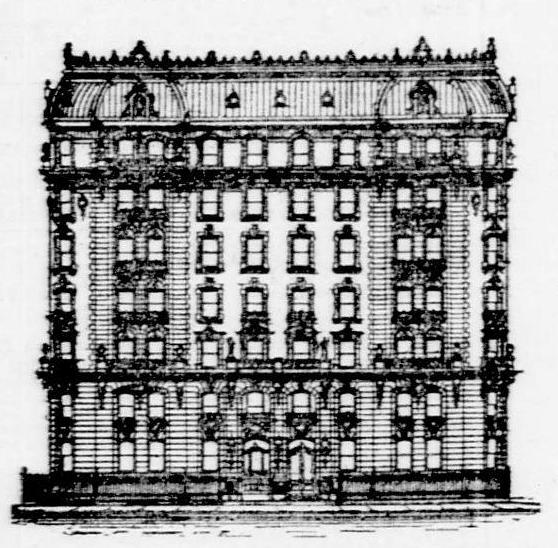 An advertisement called it “New York’s newest exclusive hotel. Delightfully located, overlooking the park.” The Town House Club was operated as a residential hotel, accepting both transient and permanent residents who could choose from single rooms or suites. One of the new guests was 24-year old Mrs. Henry Eppler who told the proprietors in 1920 that she was a motion picture actress earning $500 a week. The hefty income—about $312,000 a year today—no doubt convinced the operators that the actress was legitimate. She moved in with her mother and her five-year old son. What they did not know was the Mrs. Eppler bounced from one hotel to another, leaving when the rent was due. When she left the Town House Club in August 1920 she owed a bill of $210. That was in addition to the total of $1,000 she owed to the Biltmore, Belmont, Sherman Square, Great Northern, Chatham, Hamilton and Seville hotels in New York. She also owed room rent to hotels in Philadelphia and Boston. The judge was not swayed by her promises. She was sentenced to a term of between six months to three years in the penitentiary. The banquet rooms of The Town House Club were routinely booked by various organizations. In 1923 Chi Upsilon Fraternity held its reunion here saying “This year we are turning the Town House…into a ‘Delta Gamma House’ for the evening.” The same year, on February 5, the League of Women Voters held a dinner here. In a speech that night Mrs. Lillian R. Sire, President of the Women’s National Democratic Club blamed Great Britain for America’s drug problems. She said “England grows poppies and manufactures opium under Government supervision.” She also turned her attention to another perceived enemy—Japan. Mrs. Sire hinted that Japan might be sending drugs to our shores, because, she said, ‘it is easy to fight a nation of drug addicts,’” reported The New York Times the following day. Among the permanent residents was Mrs. Babette Bachrach, the widow of Samuel Bachrach. She and her husband were among the founders of Temple Emanu-El, the Hebrew Orphan Asylum, the Home for Aged and Infirm Hebrews, and the Mount Sinai Hospital. She died in her apartment in July 1927 at the age of 98. The grand Chatham Court, not yet 30 years old, was razed. It was replaced by masterful apartment house architect Rosario Candela’s 75 Central Park West which survives.